A key light heavyweight bout between Jimi Manuwa and Thiago Santos took place on the main card of tonight’s UFC 231 event in Toronto, Canada. 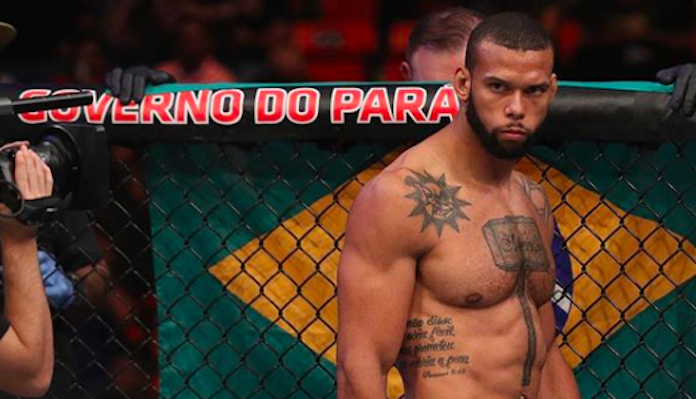 Thiago Santos enters tonight’s contest on a two-fight winning streak, his latest being a third-round TKO victory over Eryk Anders this past September. Santos has gone 6-1 over his past seven fights overall, which includes a TKO victory over surging 205-pound contender Anthony Smith. Meanwhile, Jimi Manuwa will be looking to snap a two-fight losing streak in tonight’s fight with Santos. “Poster Boy” suffered a unanimous decision loss to Jan Błachowicz in his most recent octagon appearance at UFC London. Round one begins and the fighters touch gloves. Manuwa keeps the center of the octagon. Santos with a body kick and then a punch over the top that appears to rock Manuwa. He drops but gets right back to his feet. Santos is all over him now with punches. He drops Jimi Manuwa again. The British fighter gets back up but is in all sorts of trouble. Thiago Santos with knees and punches now. The fighters battle against the cage now. Manuwa appears to stun Santos with an elbow. They break and Manuwa lands a good jab. Santos throws a spinning kick that misses but then shoots in and scores a takedown. Jimi immediately scrambles and fights his way back to his feet. The fighters clinch against the cage and Manuwa lands an uppercut. Santos responds with a kick to the body and then a knee. He pushes Jimi against the cage and lands another hard knee. Thiago continues to work knees, now aiming at the thighs of Manuwa. The fighters break and Santos charges in fearlessly with a combination. Manuwa catches him with a punch. Santos side steps and Jimi rocks him with a left. Santos is stunned. Still, he circles and then fires off a flying kick. Manuwa avoids and then jumps on Santos who fell to the canvas. After an attempted guillotine from Manuwa the horn sounds to end round one. Round two begins and Santos lands an early uppercut. Manuwa returns fire with a kick. The fighters clinch up and Jimi lands a left hook. Santos replies with aknee and then a left hand of his own. Santos is firing insane haymakers. He connects and Manuwa is rocked. Thiago Santos charges in with another massive shot and this time Jimi Manuwa faceplants! WOW!